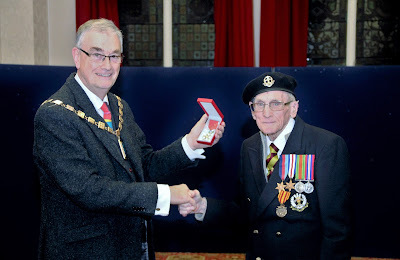 It was a genuine pleasure to meet John Shankland, who lives in Waterloo, and present him with the Legion d'Honneur on behalf of the French Government in grateful recognition for his part in the Liberation of Europe. John was a regular soldier and before the war was stationed in India. He was at Dunkirk and finished the war with the British detachment at Beslen. I met his Grandson who had accompanied him a recent visit back the the battlefields of WW2.